This article is about the star. 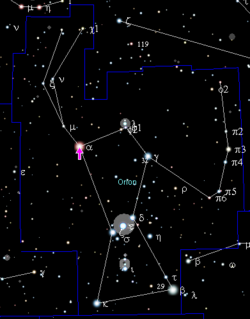 Betelgeuse is the upper left star (pink arrow) in the rectangle of bright stars in Orion. Alpha Orionis, 58 Ori, HR 2061, BD+7°1055, HD 39801, SAO 113271, FK5 224, HIP 27989. Betelgeuse (also called Alpha Orionis, α Orionis, or α Ori) is one of the brightest and largest known stars, though it is not one of the most massive. Located approximately 600 light-years from Earth, it is part of the constellation Orion and a vertex of the Winter Triangle asterism. Its large volume suggests that if it were at the center of the Solar System, it would wholly engulf Mercury, Venus, Earth, and Mars, with its surface extending out to between the orbits of Mars and Jupiter. It is classified as a red supergiant and as a semiregular variable star—that is, it shows considerable periodicity as its light changes, but this periodicity is sometimes irregular. The name Betelgeuse is a corruption of the Arabic yad al-jawzā (يد الجوزاء), meaning "hand of the central one." The Arabs had earlier called Gemini Jauza ("the central one") but later switched this name to Orion. European mistransliteration into Latin during the Middle Ages led to the first character y (ﻴ, with two dots underneath) being misread as a b (ﺒ, with only one dot underneath). Thus throughout the Renaissance, the star's name was written as Bait al-Jauza and thought to mean armpit of the central one in Arabic. This led to the modern rendering as Betelgeuse (although a true translation of "armpit" would be ابط, transliterated as Ibţ, hence in 1899 Richard Hinckley Allen mistakenly gave the origin as Ibţ al Jauzah). In German, the star's name was corrupted even further: it is called Beteigeuze, because the letter l in the Romanized name was mistaken for the letter i. In Chinese, Betelgeuse is known as Shēnsùsì (参宿四), or the "Fourth Star of the Constellation of Three Stars," because the Constellation of Three Stars was at first a name for only three stars in the girdle of the Orion. Four more stars were later added to this constellation, but the earlier name stuck. Given its rich reddish color, Betelgeuse has also been called "the martial one," and in astrology it portends military or civic honors. Betelgeuse is the second brightest star in the constellation Orion and the ninth brightest star in the night sky. Although it has the Bayer designation alpha, Rigel (Beta Orionis) is usually brighter. Yet, as a variable star, Betelgeuse is occasionally brighter than Rigel. Betelgeuse's variability in brightness was first described by Sir John Herschel in 1836 when he published his observations of the star in Outlines of Astronomy, noting the variations increased between 1836-1840, then decreased again. In 1849 he noted a shorter cycle of variability which peaked in 1852. Later observers recorded unusually high maxima with an interval of several years but only small variations between 1957 and 1967. Records of the American Association of Variable Star Observers show maximum brightnesses of magnitude 0.2 in 1933 and 1942, with minimums below magnitude 1.2 in 1927 and 1941. In 1919, Albert Michelson and Francis Pease mounted a 6-meter (20-foot) interferometer on the front of the 2.5 meter (100-inch) telescope at Mount Wilson Observatory. Helped by John A. Anderson, in December 1920 Pease measured the angular diameter of α Orionis as 0.047 arcseconds. Given the then-current parallax value of 0.018 arcseconds, this resulted in an estimated radius of 3.84 × 108 km (240 million miles). However there was known uncertainty owing to limb darkening and measurement errors. More recent visible-light observations of Betelgeuse have found the diameter to vary between 0.0568 and 0.0592 arcseconds. In the late 1980s and early 1990s, Betelgeuse became a regular target for Aperture Masking Interferometry visible-light imaging, revealing a number of bright spots on the star's surface, which were thought to result from convection. In 1995 the Faint Object Camera on the Hubble Space Telescope was used to capture the first conventional-telescope image (or "direct-image" in NASA terminology) of Betelgeuse (this was the first of any star other than the Sun). The ultra-violet image revealed a bright patch on the southwestern portion of the star's surface. This patch had a higher temperature than the surrounding stellar photosphere. Visual observation has shown Betelgeuse's rotation axis has an inclination of about 20° to the direction of Earth and a position (or height) angle of about 55°. Hence, the hot spot seen in 1995 is likely one of the star's poles. Recent infrared measurements of the disk of Betelgeuse gave a mid-infrared angular diameter of 54.7 ± 0.3 milli-arcseconds in November 1999, slightly smaller than the typical visible-light angular diameter. These measurements ignored any possible contribution from hotspots (which are less-noticeable in the mid-infrared) but factored-in some limb darkening, whereby the intensity of a star's image diminishes near the edge. Some adjustment is needed to compensate for gas near the photosphere of Betelgeuse. Betelgeuse imaged in ultraviolet light by the Hubble Space Telescope and subsequently enhanced by NASA. The bright white spot is likely one of its poles. NASA/ESA credit. AAVSO V-band light curve of Betelgeuse (Alpha Orionis) from Dec. 1988 to Aug. 2002. Betelgeuse has several features of particular interest to astronomers. Because of the size and proximity of this star, it has the third largest angular diameter as viewed from Earth, smaller only than the Sun and R Doradus. Moreover, it is one of only a dozen or so stars telescopes have imaged as a visible disk. The angular diameter of Betelgeuse was one of the first to be measured with an astronomical interferometer and the apparent diameter was found to be variable. The distance to Betelgeuse is not known with precision but if this is assumed to be 640 light years, the star's diameter would be about 950 to 1000 times that of the Sun. Betelgeuse has a color index (B-V) of 1.86 and is thought to have a mass of about 20 solar masses. The precise diameter is hard to define since optical emissions decrease very gradually with radius from the center of Betelgeuse and the color of these emissions also vary with radius. Though only 20 times more massive than the Sun, this star could be hundreds of millions times greater in volume (as with a beach ball compared to a large stadium). Betelgeuse was the first star on which starspots were resolved in optical images by a telescope, first from Aperture Masking Interferometry and later from the Hubble Space Telescope along with more detailed observations by the COAST telescope. Betelgeuse's photosphere has an extended atmosphere which displays strong lines of emission (rather than absorption). This chromosphere has a temperature no higher than 5,500 K and may stretch outward to 7 times the diameter of the star. This extended gaseous atmosphere has been observed moving both away from and towards Betelgeuse, apparently depending on radial velocity fluctuations in the photosphere. It seems likely that Betelgeuse will become a supernova. Considering its size and apparent young age of only 8.5 million years, it may explode within the next thousand years, or may have already. Since its rotational axis is not toward the Earth, Betelgeuse's supernova might not cause a gamma ray burst in the direction of Earth large enough to damage its ecosystem even from a relatively close proximity of 640 light years. However, a Betelgeuse supernova could easily outshine the Moon in the night sky. ↑ 1.0 1.1 1.2 1.3 1.4 1.5 1.6 1.7 1.8 SIMBAD query result: V* alf Ori—Semi-regular pulsating Star. Centre de Données astronomiques de Strasbourg. Retrieved November 11, 2008. ↑ 2.0 2.1 2.2 Graham M. Harper, Alexander Brown, and Edward F. Guinan. 2008. A New VLA-Hipparcos Distance to Betelgeuse and its Implications. The Astronomical Journal 135(4):1430-1440. (5), Table 6. Retrieved November 11, 2008. ↑ 3.0 3.1 3.2 3.3 3.4 3.5 Jim Kaler, Stars 2008. Betelgeuse (Alpha Orionis). University of Illinois. Retrieved November 11, 2008. ↑ 4.0 4.1 4.2 A. Lobel, and A.K. Dupree. 2000. Modeling the Variable Chromosphere of α Orionis. The Astrophysical Journal 545:454–474. Retrieved November 11, 2008. ↑ 5.0 5.1 H. Uitenbroek, A.K. Dupree, and R.L. Gilliland. 1998. Spatially Resolved Hubble Space Telescope Spectra of the Chromosphere of α Orionis. The Astronomical Journal 116:2501–2512. Retrieved November 11, 2008. ↑ Paul Kunitzsch and Tim Smart. 2006. A Dictionary of Modern Star Names. (Cambridge, MA: Sky Publishing. ISBN 9781931559447), 45. ↑ 7.0 7.1 7.2 7.3 7.4 7.5 7.6 7.7 Richard Hinckley Allen, 1963. Star Names: Their Lore and Meaning. (New York, NY: Dover Publications. ISBN 0486210790). ↑ Robert Burnham, Jr. 1978. Burnham's Celestial Handbook: An Observer's Guide to the Universe Beyond the Solar System, Volume 2. (New York, NY: Courier Dover Publications. ISBN 0486235688), 1290. ↑ A.A. Michelson, and F.G. Pease. 1921. Measurement of the diameter of alpha Orionis with the interferometer. Astrophysical Journal 53:249–259. Retrieved November 11, 2008. ↑ Staff. 2000. [http://eaa.crcpress.com/default.asp?action=summary&articleId=3915 Pease, Francis G (1881–1938). Encyclopedia of Astronomy and Astrophysics. Retrieved November 11, 2008. ↑ D. Buscher, et al. 1990. Detection of a bright feature on the surface of Betelgeuse. Monthly Notices of the Royal Astronomical Society 245:7.; R. Wilson, et al. 1997. The changing face of Betelgeuse. Monthly Notices of the Royal Astronomical Society 291:819. Retrieved November 11, 2008. ↑ J. Weiner, et al. 2000. Precision Measurements of the Diameters of α Orionis and ο Ceti at 11 Microns. The Astrophysical Journal 544(2):1097–1100. Retrieved November 11, 2008. 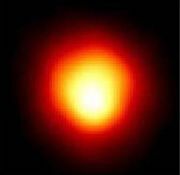 ↑ The yellow/red "image" or "photo" of Betelgeuse usually seen is actually not a picture of the red giant but rather a mathematically generated image based on the photograph. The photograph was actually of much lower resolution: The entire Betelgeuse image fit entirely within a 10x10 pixel area on the Hubble Space Telescopes Faint Object Camera. The actual images were oversampled by a factor of 5 with bicubic spline interpolation, then deconvolved. ↑ Ronald Gilliland and A. K. Dupree. May 1996. First Image of the Surface of a Star with the Hubble Space Telescope. Astrophysical Journal Letters 463:L29. Retrieved November 11, 2008. ↑ T.R. Bedding, et al. 1997. The angular diameter of R Doradus: a nearby Mira-like star. Monthly Notices of the Royal Astronomical Society 286(4):957–962. Retrieved November 11, 2008. ↑ D. Burns, et al. 1997. The surface structure and limb-darkening profile of Betelgeuse. Monthly Notices of the Royal Astronomical Society 290(1):L11–L16. Retrieved November 11, 2008. ↑ 17.0 17.1 17.2 17.3 Deborah Byrd, Joel Block, Lindsay Patterson, and Jorge Salazar. Betelgeuse could explode as a supernova, Radio Podcasts &#124. Earth & Sky. Retrieved November 11, 2008. Allen, Richard Hinckley. 1963. Star Names: Their Lore and Meaning. New York, NY: Dover Publications. ISBN 0486210790. Burnham, Robert Jr. 1978. Burnham's Celestial Handbook: An Observer's Guide to the Universe Beyond the Solar System, Volume 2. New York, NY: Courier Dover Publications. ISBN 0486235688. Kunitzsch, Paul, and Tim Smart. 2006. A Dictionary of Modern Star Names. Cambridge, MA: Sky Publishing. ISBN 9781931559447. Tuthill, Peter G., Chris A. Haniff, and John E. Baldwin. 1997. Hotspots on late-type supergiants. Monthly Notices of the Royal Astronomical Society. 285(3):529–539. All links retrieved June 4, 2016. Invisible Giant: Chandra's Limits on X-rays from Betelgeuse. This page was last modified on 18 May 2018, at 15:07.